Available separately through our boutique shop or call to add to order. 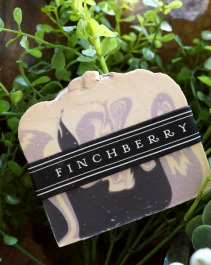 859-491-4400 Sweetly Southern: Honeysuckle scent Each bar of Finchberry Soap contains natural, food grade ingredients, a unique decadent appearance, and a lush gentle lather. 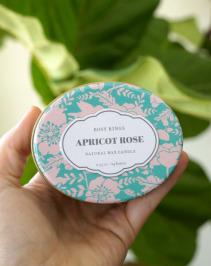 In addition, our soaps are gluten-free, vegan-friendly, and made without any harsh chemical preservatives. Our soaps are not just a cleanser, but sensory experience you can savor daily. Available separately through our boutique shop or call to add to order. 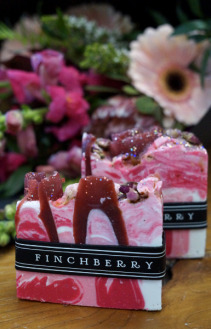 859-491-4400 Tart Me Up: Raspberry and Lemon scent Each bar of Finchberry Soap contains natural, food grade ingredients, a unique decadent appearance, and a lush gentle lather. 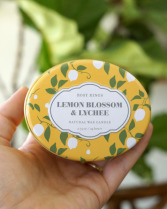 In addition, our soaps are gluten-free, vegan-friendly, and made without any harsh chemical preservatives. Our soaps are not just a cleanser, but sensory experience you can savor daily. Available separately through our boutique shop or call to add to order. 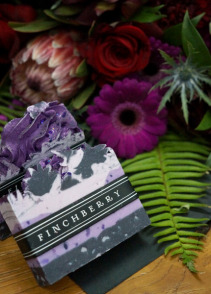 859-491-4400 Grapes of Wrath: Grape Berry Scent Each bar of Finchberry Soap contains natural, food grade ingredients, a unique decadent appearance, and a lush gentle lather. 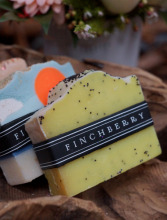 In addition, our soaps are gluten-free, vegan-friendly, and made without any harsh chemical preservatives. Our soaps are not just a cleanser, but sensory experience you can savor daily. Available separately through our boutique shop or call to add to order. 859-491-4400 Lovin' Lemons: Lemon, grapefruit and orange scent Each bar of Finchberry Soap contains natural, food grade ingredients, a unique decadent appearance, and a lush gentle lather. 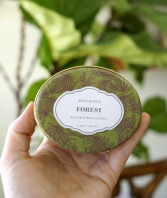 In addition, our soaps are gluten-free, vegan-friendly, and made without any harsh chemical preservatives. 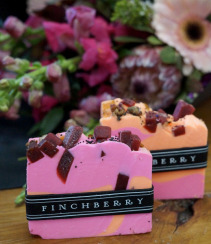 Our soaps are not just a cleanser, but sensory experience you can savor daily. Available separately through our boutique shop or call to add to order. 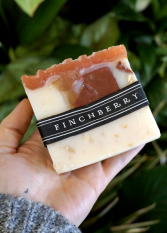 859-491-4400 Rosey Posey: Fresh cut rose scent Each bar of Finchberry Soap contains natural, food grade ingredients, a unique decadent appearance, and a lush gentle lather. In addition, our soaps are gluten-free, vegan-friendly, and made without any harsh chemical preservatives. 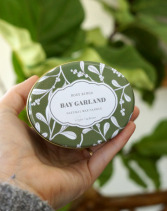 Our soaps are not just a cleanser, but sensory experience you can savor daily. Available separately through our boutique shop or call to add to order. 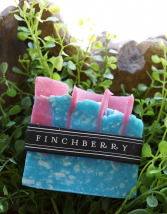 859-491-4400 Appely Ever After: Crisp Apple Scent Each bar of Finchberry Soap contains natural, food grade ingredients, a unique decadent appearance, and a lush gentle lather. In addition, our soaps are gluten-free, vegan-friendly, and made without any harsh chemical preservatives. 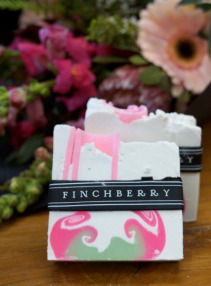 Our soaps are not just a cleanser, but sensory experience you can savor daily. Available separately through our boutique shop or call to add to order. 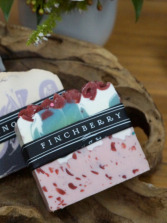 859-491-4400 Cranberry Chutney: Cranberry, apple and blackberry Each bar of Finchberry Soap contains natural, food grade ingredients, a unique decadent appearance, and a lush gentle lather. In addition, our soaps are gluten-free, vegan-friendly, and made without any harsh chemical preservatives. Our soaps are not just a cleanser, but sensory experience you can savor daily. Available separately through our boutique shop or call to add to order. 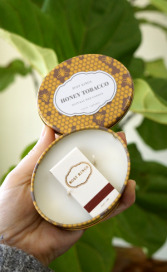 859-491-4400 Renegade Honey: Almond and Honey scent Each bar of Finchberry Soap contains natural, food grade ingredients, a unique decadent appearance, and a lush gentle lather. 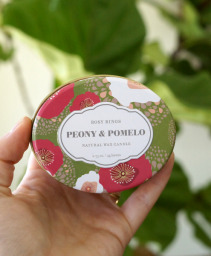 In addition, our soaps are gluten-free, vegan-friendly, and made without any harsh chemical preservatives. Our soaps are not just a cleanser, but sensory experience you can savor daily. Available separately through our boutique shop or call to add to order. 859-491-4400 Sweet Dreams: Lavender and Vanilla scented Each bar of Finchberry Soap contains natural, food grade ingredients, a unique decadent appearance, and a lush gentle lather. 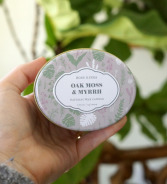 In addition, our soaps are gluten-free, vegan-friendly, and made without any harsh chemical preservatives. Our soaps are not just a cleanser, but sensory experience you can savor daily. Available separately through our boutique shop or call to add to order. 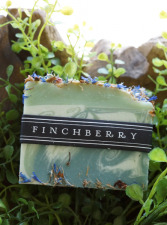 859-491-4400 Mint Condition: Mint, Lemongrass and Rose scent Each bar of Finchberry Soap contains natural, food grade ingredients, a unique decadent appearance, and a lush gentle lather. In addition, our soaps are gluten-free, vegan-friendly, and made without any harsh chemical preservatives. 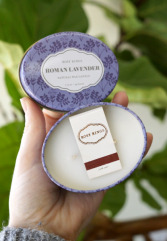 Our soaps are not just a cleanser, but sensory experience you can savor daily. Available separately through our boutique shop or call to add to order. 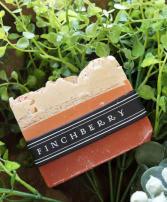 859-491-4400 Moxie: Canteloupe and Watermelon scent Each bar of Finchberry Soap contains natural, food grade ingredients, a unique decadent appearance, and a lush gentle lather. In addition, our soaps are gluten-free, vegan-friendly, and made without any harsh chemical preservatives. Our soaps are not just a cleanser, but sensory experience you can savor daily. Available separately through our boutique shop or call to add to order. 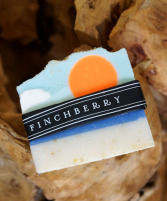 859-491-4400 Tropical Sunshine: Lime, Coconut, Mandarin and Jasmine Each bar of Finchberry Soap contains natural, food grade ingredients, a unique decadent appearance, and a lush gentle lather. In addition, our soaps are gluten-free, vegan-friendly, and made without any harsh chemical preservatives. Our soaps are not just a cleanser, but sensory experience you can savor daily. Available separately through our boutique shop or call to add to order. 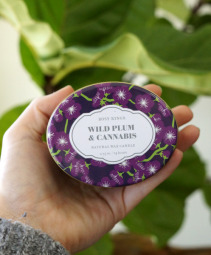 859-491-4400 Wild, ripe plums and fresh green fig leaves are layered with an opulent accord of oud wood, spices and exotic cannabis blossoms. 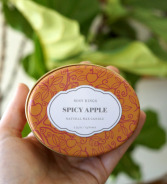 Fragrance Notes: Fig Leaf, Wild Plum, Violet, Raspberry Nectar, Oud, Saffron Fragrance Classification: Spicy Exotic Details: Fragrant and pretty, our signature tins are hand poured with a veggie wax blend. When you're looking for a unique hostess gift, token of appreciation or just a surprise to brighten someone's day, let Petri's Floral & Boutique deliver one of our unique, handcrafted or luxurious gifts! Add a gorgeous gift to any floral arrangement or send something special just because!